Alan Ashton provides this photo, captioned "Fela Sowandie," from the "1946 Theatre Organ World publication"
Fela Sowande is undoubtedly the father of modern Nigerian Art Music and perhaps the most distinguished and internationally known African composer. The most significant pioneer-composer of works in the European classical idiom, his works mark the beginning of an era of modern Nigerian Art Music. Fela Sowande (1905-1987) was a Nigerian composer, a highlife musician, a jazz pianist, the first musician to introduce the Hammond organ into jazz music in London in the 1930s, and one of he pioneering ethnomusicologists in Nigeria. Fela's father was Emmanuel Sowande, an Anglican priest of Egba descent who helped establish Nigerian church music in the early 20th century. The elder Sowande taught at St. Andrew's College, a missionary institute in Nigeria which trained young people to become teachers. Emmanuel Sowande was subsequently transferred to Lagos, and young Fela accompanied him there. Fela's father arranged for him to be a choir boy at Christ Church Cathedral. ...European music and particularly the organ works of Bach, Handel, and Rheinberger, as well as Coleridge-Taylor's Hiawatha's wedding feast. On his graduation from Kings College, he was an accomplished pianist and was engaged as deputy organist under Phillips at the Cathedral. Simultaneously, he taught in a mission school and worked as a civil servant for three years. In establishing the foundations of Fela Sowande's musicianship it is necessary to note the importance of the works of the pioneering Nigerian church musicians. Sowande studied and worked with some of these musicians, and later imitated their styles in his own compositions. Throughout his lifetime, Sowande continued to cherish his interaction with Phillips, and was always eager to reminisce on the link between his own successful career and the training he received from Phillips. Phillips gave me my first introduction to European Music (Southern, 1976). The book describes some of the features that Phillips insisted must be adopted by composers. These features include the use of the pentatonic scale, melodic reflection of the contour of texts, avoidance of cadential semitones and predominance of parallel harmonies. Some of these features would later influence Sowande's own style. This led to his organization of the Triumph Dance Club Orchestra, in which he played piano. 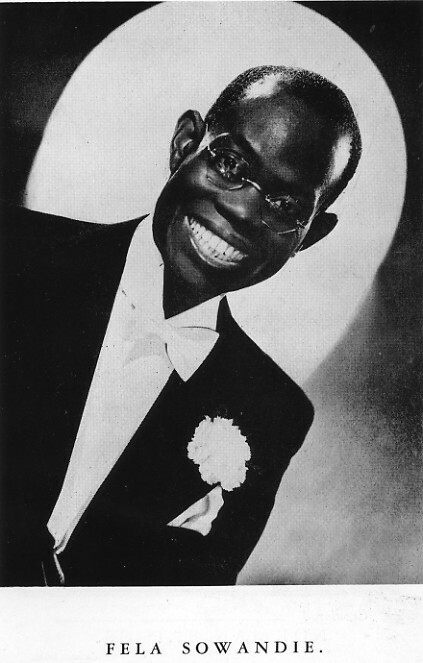 He was also a member of the jazz band, The Chocolate Dandies, that had been organized about 1927 in Lagos. However he was influenced by these contacts, it was in 1935 that he began coping with nationalistic impulses, which were articulated in his articles from 1965, the development of a national tradition of music and Language in African music. Sowande took lessons in jazz piano, and began performing on both the piano and the Hammond organ. A number of African Americans who visited London became his friends. They included Paul Robeson and Fats Waller. Sowande performed George Gershwin's Rhapsody in Blue as part of the show Black Birds of 1936. This brought him into contact with J. Rosamond Johnson, who served as choral conductor for the production and who introduced him to the works of Robert Nathaniel Dett. He joined Adelaide Hall as her cabaret pianist and recorded with her in the last years of the 1930s. 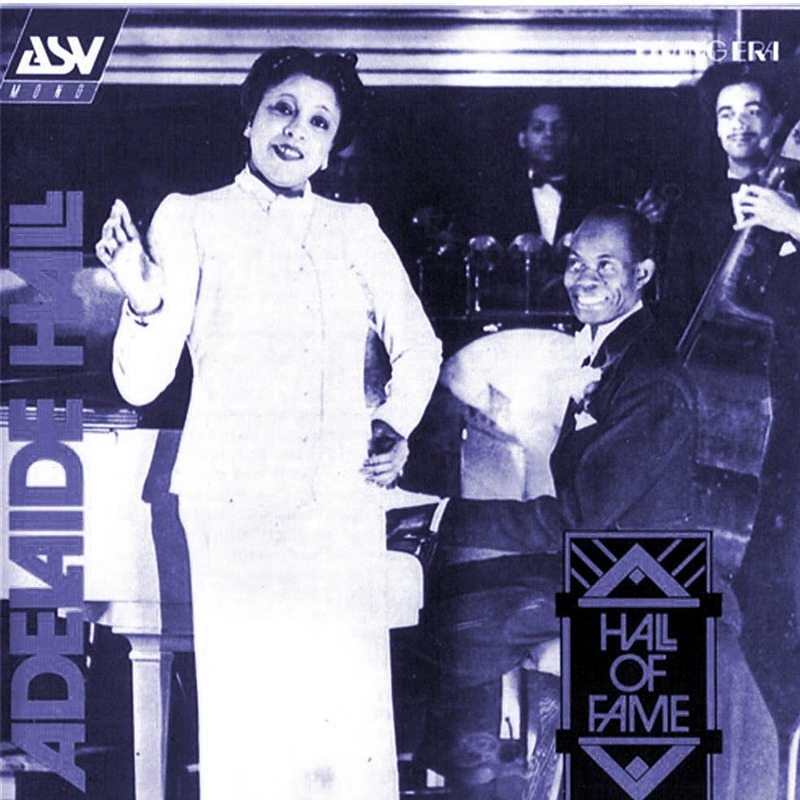 A photo in the left column shows Adelaide Hall and Fela Sowande on the cover of an ASV LP Record. It has been provided by Alan Ashton, a former BBC Radio Manchester host who interviewed Sowande after he began teaching in the U.S. The above photo of Fela Sowande in white tie was also provided by Alan Ashton. He made a number of broadcasts on the BBC theatre organ as a solo performer, and is still heard as accompanist, on Hammond organ, to Adelaide Hall. I also believe that he appeared in the stage production of Black Birds. His signature tune during those popular organ music days was Deep Purple...for obvious reasons! I have just come across the entry in the 1946 Theatre Organ World publication, and if you would like it I can also copy you an excellent photo from that book. The photo now appears at the top of this column. Son of an Anglican minister, came to England in 1934 from Southern Nigeria to study civil engineering and music. Joined Blackbirds Production of 1935 and 1936 as solo pianist for Gershwin's Rhapsody in Blue, a work later performed in Glasgow during the war years with the London Philharmonic Orchestra. Has been dance-pianist, dance-band leader, variety artist. Featured a rhythmic style on the Hammond organ at clubs and stage, recording several discs for Decca, and accompanying Adelaide Hall for stage, radio and recording sessions. Was a regular broadcaster before the war, with the signature tune of “Deep Purple.” Joined R.A.F. In 1941, recording several entertainment discs of organ music for Forces overseas. During war years took his Fellowship of the Royal College of Organists, and the first part of the Mus.Bac. of the University of London. Went on loan from the R.A.F. As musical director to the Colonial Film Unit, branch of the then Ministry of Information, where he still is. Now also organist at Kingsway Hall, London (West London Mission). Spot recently in “Lisbon Story.” Has had his two chorale preludes for organ on Yoruba folk-melodies published by Novello. For a budding African composer like Sowande, similar models were also provided in the United States, where composers like Harry Freeman (1870-1954), Will Marion Cook (1869-1944), Clarence Cameron White (1880-1960), Florence Price (1888-1953) and William Grant Still (1895-1978) were beginning to attract the attention of lovers of classical music. Sowande's ambition as a composer and as a performer was not merely to excel in Western art music. His most important objective, as his career progressed, was to project his African identity in his compositions and performances. Fela Sowande's music emanates from domains of thought transcending the boundaries of Artistic creativity. Composed at this time was his personal "signature tune", based on a sacred melody (Obangiji) composed by Rev. Joshua Jesse Ransome-Kuti that served its needs and those of the BBC's African programs from 1943 to the 1960s. It was in 1943 that he earned the Fellowship diploma of the Royal College of Organists, as well as the Limas Prize for music theory, the Harding Prize for his organ playing, and the Read Prize for the overall excellence of his examinations, along with his B.M. degree from the University of London. He was appointed organist and choir director of the West London Mission of the Methodist Church in 1945 (Kingsway Hall), which stimulated the creation of new works for organ. His Sunday recitals became very popular. These were later to be developed into original compositions, in particular, Six Sketches for Full Orchestra and the African Suite, both of which were issued on Decca Records in London in 1953. The African Suite, written in 1944, combines well-known West African musics with European forces and methods. For the opening movement, Joyful Day, Sowande uses a melody written by Ghanaian composer Ephrain Amu, as he does in the fourth movement, Onipe. In Nostalgia, Sowande composes a traditional slow movement to express his nostalgia for the homeland (in itself a rather European idea). At the centre of the work is a restive Lullaby, based on a folk original. The finale of the Suite, Akinla, traces a very singular musical history. It began as a popular Highlife tune - Highlife being a pungent, 20th-century style, combining colonial Western military and popular music with West African elements and a history of its own. Sowande then featured it as a cornerstone of his "argument" that West African music could be heard on European terms: the African Suite was originally broadcast by the BBC to the British colonies in Africa. It was during this period that he began active composition; it is not surprising that many of his early works were written for the organ. The church element which formed the basic foundation of his musical career continued to be the axis of his musical life. Organ works written during this period included Oyigiyigi, Kyrie, Prayer, Obangiji, Gloria and Ka Mura. These, like virtually all Sowande's organ works, are based on Nigerian melodies. In this post he produced weekly radio programs based on field research of Yoruba folklore, mythology, and oral history, presented by tribal priests. On his return to Nigeria, Fela Sowande was commissioned by the Director General of the NBS, Mr. Tom Chalmers, to write a work for the Lagos Musical Society to perform for the coronation of Queen Elizabeth II. He wrote the anthem Out of Zion, which was performed by the society, with Fela Sowande accompanying. Between 1955 and 1958, Sowande composed four songs based on African American gospel music: Roll de Ol' Chariot, My Way's Cloudy, De Ol' Ark's a-Moverin, and De Angels are Watchin'. 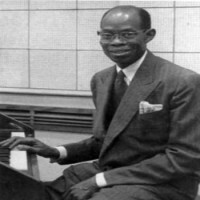 De Lerma notes that a grant from the United States Government enabled Sowande to travel to the U.S. in 1957 and give organ recitals in Boston, Chicago and New York. While in the country he also lectured on the findings of his research. 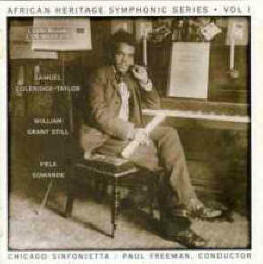 The experimental use of the Western orchestra by Sowande to imitate African musical procedures, marked a radical departure from the sacred vocal compositions of earlier composers like Phillips and Rev. J.J. Kuti. It is an experimental procedure that opened the worldview of younger generations beyond the confines of sacred vocal music to the almost infinite possibilities that an instrumental medium offered. Younger Nigerian composers were excited by these new horizons, and they quickly invaded the instrumental idiom in an invigorated manner. For example Sam Akpabot wrote, among others, Scenes from Nigeria (Wind Orchestra, 1962) while Euba wrote Oluroumbi (Symphony Orchestra, 1967); Ekwueme wrote Rhapsody for Strings, while Uzoigwe wrote Fanfare (wind orchestra, 1983). In 1960 he composed, on commission, his Folk Symphony for symphony orchestra. The symphony, the most important orchestral work by a West African composer, was premiered in 1960; but the dilemma that would engage Sowande for the rest of his career began to manifest with the composing of his particular work. Commissioned and written specifically for Nigeria's independence celebrations, the work was one of the creative works especially devoted to that anniversary to showcase the various talents and potentials of the country. Choral and dramatic works were also commissioned for the occasion. While all these other creative works were performed and produced in Nigeria, Sowande's symphony simply could not be performed by Nigerians because there was no symphony orchestra in the country. Not often nowadays does an audience which has just heard the first concert performance of a new symphony disperse humming tunes from it, as did last night's Winter Gardens audience; not often is such a work received with cheers as was a Folk Symphony by the Nigerian composer Fela Sowande after the Bournemouth Symphony Orchestra had played it. 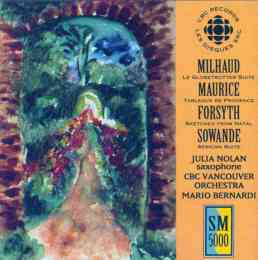 This remarkable reception stamped Mr. Sowande at once as having a capacity to communicate directly to his audience, which few modern composers possess. The composer has a genuine gift for melody, is an inventive orchestrator and gives his writing a tang of originality by his use of spicy, rhythms of his native land. His known compositions number over one hundred, consisting of a variety of instrumental and vocal works. The list covers small-, medium- and large-scale works, including a tone poem and a symphony. Although many works were published in the fifties and sixties, a good number were never published. His compositions can be grouped under the categories of keyboard works, orchestral works, African-American choral works, solo art songs, and choral works. Sowande also wrote eighteen works for the Western orchestra. Like his organ works, many of these works are based on African themes. Most were written in England, as pieces commissioned by the BBC. For example, his Six Sketches (for full orchestra) and the African Suite (for strings orchestra) were originally conceived as illustrative compositions, written under commission by the BBC under its Overseas Program titled "West African Music and the Possibilities of its Development." As I explained in chapter two, the very first performance of his orchestral work took place in London in 1944, when the BBC Orchestra performed the tone poem Africana under the baton of Sowande himself. Other works in this category include Snow-Capped Kilimanjoro (full orchestra), Six African Melodies for Western Instruments (small ensemble), Valse Galante (full orchestra, Koronga (full orchestra) and An Evening Procession (full orchestra). Sowande's organ works occupy an important historical place within the tradition of modern Nigerian music. As one of the most important and earliest Nigerian composers of art music in the European classical idiom, his organ works (written in the 1940s and early 1950) were some of the earliest examples of the tradition. From 1962 until 1965 he was senior research fellow at the University of Ibadan, then becoming musicology professor at the university's Institute of African Studies. 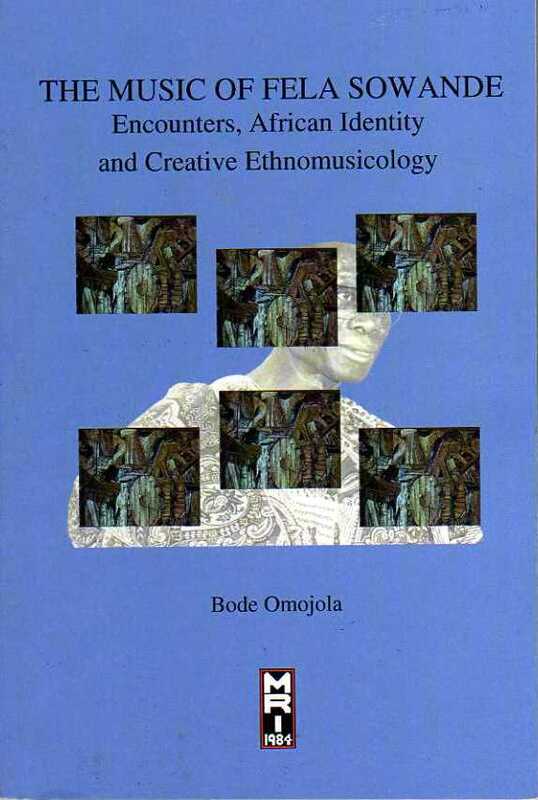 A government grant in 1966 resulted in a series of studies on Nigerian music. Sowande also studied Yoruba religion from 1962-65 with the aid of a grant from the Ford Foundation. In 1968 he returned to the U.S. to accept a position on the faculty of Howard University in Washington. D.C. He held it until 1972. Between 1968 and 1972, Sowande made at least 48 recordings on the history, language, literature and music of Nigeria, for distribution by the Broadcasting Foundation of America. He became professor of Black studies at the University of Pittsburgh in 1972, later joining the faculty of the School of Education. He was affectionately known here as 'Papa Sowande'. His last position was in the Department of Pan-African Studies at Kent State University, which he held until his retirement in 1982, accompanied by Eleanor, his wife. A memorial service was held at St. James Episcopal Church in New York on 3 May 1987, at which time Eugene Hancock complied with Sowande's 1965 request by performing his Bury me eas' or wes'. Sowande had received a permanent American visa in 1972 and had become a citizen in 1977. Queen Elizabeth II named him a Member of the British Empire in 1956, the same year he became a Member of the Federal Republic of Nigeria. The music department at theUniversity of Nigeria-Nsukka, was renamed the Sowande School of Music in his honor (1962). In 1968 he was given the Traditional Chieftancy Award, named the Bagbile of Lagos. He was given an honorary doctorate by the University of Ife in 1972. The Fela Sowande Memorial Lecture and Concert Series is an ongoing tribute which has been held at the Institute of African Studies of the University of Ibadan since 1996. The Fela Sowande Centennial Symposia and Festivals took place in North America in 2004, and in Europe and Africa in 2005, to mark the centennial of the composer's birth.